Looking for Havasupai Permits to hike to Havasu Falls? Want to see the waterfalls of the Grand Canyon but you don’t know much about the area? You may have heard that you need permits and are wondering how to reserve Havasupai permits, this blog has the answers. Havasu Canyon is one of those rare places that mixes remoteness with must-see grandeur with a tough permit system. This formula means only a select few who have the inside track get to see Havasu Falls. So here it is, how to reserve Havasupai permits, straight from the guides who have been exploring the canyon for almost two decades. To make camping reservations in Havasupai, you must reserve online at havasupaireservations.com beginning on February 1, 2019 at 8am MST. You must create an account online before Feburary 1. You cannot make a reservation over the phone. Be warned, Havasupai camping permits often sell out for the entire season within minutes. The most desirable dates (such as hiking to Havasupai on Memorial Day weekend) will be reserved on February first. The tribe is issuing 2019 permits for a minimum duration of 3 nights. This means that if you get a reservation starting on Monday, you will pay a minimum of $300 ($100/night for your minimum 3 nights stay). If you get a reservation starting on Wednesday, you will pay a minimum of $325 ($100/night for Wed. and Thurs. and $125 for Friday). *Note, this price includes taxes and fees but is subject to change at the tribe’s discretion. Once you secure your permit on February 1, start planning your trip! AOA’s outfitting package provides all the rental gear, food, and insider info you need to have a safe and memorable trip to Havasu Falls. Due to increased popularity of visiting Havasu Falls and hiking to the other waterfalls in Havasu Canyon, the Havasupai tribe has instituted changes to how they manage reservations and permits. One credit card is allowed per group. Drones are not permitted and are subject to a $1000 fee. There is a maximum of 10 people per reservation. 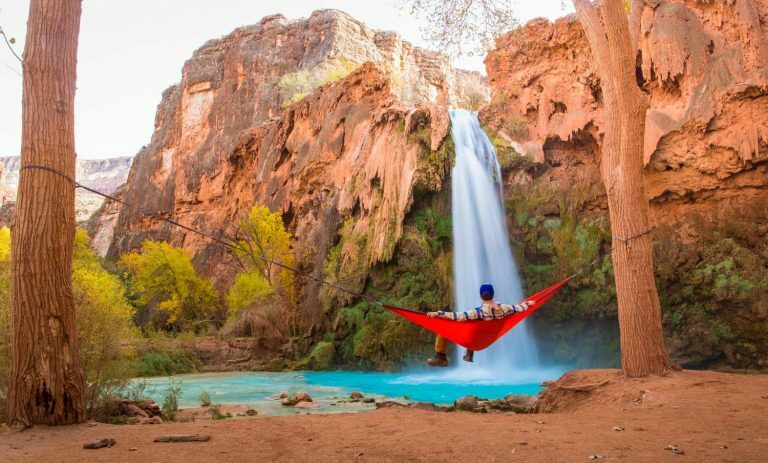 The campground is located within a 5-minute walk of the beautiful 100-foot Havasu Falls, and is about 2 miles downhill from the Village of Supai. In between the Village and the campground there are two other waterfalls. (See our blog post about Havasu Falls and the other waterfalls of Havasupai.) The campground is about ¾ of a mile long and spots are not defined and are available on a first come, first served basis. There are many wonderful spots to choose from throughout the campground. Lastly, there are no campfires allowed in the campground. To make reservations at the lodge, the only hotel near Havasu Falls, call (928) 448-2111. The Havasupai Lodge is in the village of Supai, Arizona which is about a 2 mile hike away from Havasu Falls. The Lodge offers basic accommodations. Reservations at the lodge are already booked for 2019. Reservations for 2020 will come available on June 1. *All fees are taxable at 10%. There is no kitchen or food provided at the lodge. You’ll need to come prepared to provide all your own meals. You can get food from the Supai Café (burger, fries, hot dogs, fry bread, tacos, sodas, etc) or from the Supai grocery store, located in the village. Hours can occasionally be unpredictable at both the cafe and the store. Due to the remote location of the village, the prices are quite expensive. In 2019, AOA will not be offering the famous guided trips with permits included we have been guiding in Havasupai for the last 22 years. If you have questions about these trips, feel free to send us an email here. If you are looking for something similar, check out our alternatives. Packhorses carry all your gear aside from the water, lunch and personal items you need for the trek into the canyon. Stay in a comfortable camp near Havasu Falls beside the clear blue waters of Havasu creek, and spend days swimming beneath the falls and relaxing in AOA’s comfortable basecamp. This adventurous trek is perfect for more intrepid travelers. Carry only your personal gear and hike to our creekside base camp with a fully outfitted kitchen, don’t worry, all basecamp amenities will be provided for you.. Enjoy guided hikes to the waterfalls and unusual viewpoints around the canyon. 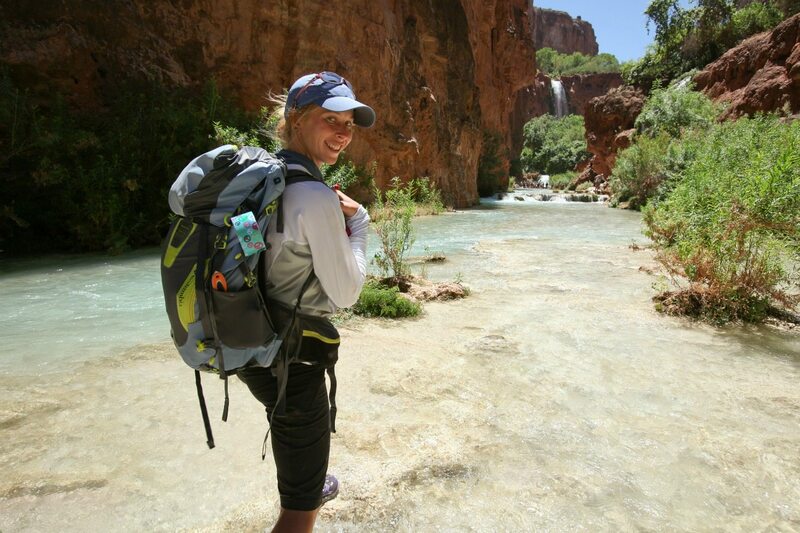 The most rugged of AOA’s Havasupai hiking options and although it’s strenuous, all gear is provided. Want to journey to this desert paradise, but not sure where to start? We’ve taken our decades of experience and created Your Guide to Havasupai: Everything You Need to Know. In it, you’ll get tips on packing, getting a permit, where to stay, and some must-see additions to your itinerary. This page is not affiliated with the Havasupai Tribe. We do not sell Havasupai permits.